French country curves that are elegant yet relaxed add to the look and feel of the Amish French Country Side Board. Scalloped edging flows and curves along the top backsplash and the server base, while turned legs show off a convenient lower shelf. 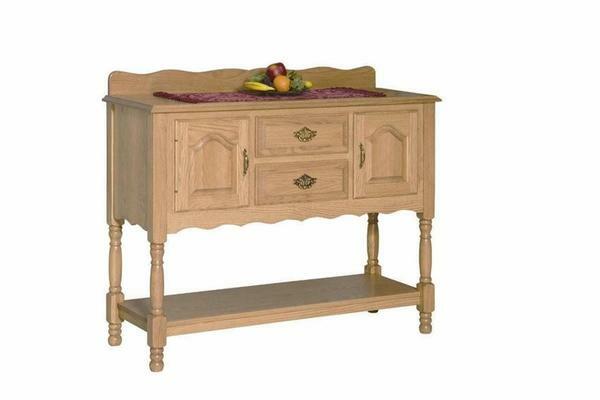 Equipped with elegance for serving and storage, this side board is handcrafted by the Amish to last. Designing with french country furniture is fun! It's an opportunity to combine fancy and simple and new with old. Your version of this French Country Side Board is just waiting to be built. With just a few clicks your order can be underway. If you prefer, get in touch by email or phone and a Furniture Specialist will be happy to help you. We can't wait for you to see your new solid wood furniture. Thank you for shopping with us.